My sympathy card stock is sadly depleted at the moment. I like to have these type of cards on hand. Sometimes I am sending them out, but often a friend asks if I have one on hand as they want to send something made with love. My NBUS item today is this modest background DP. It is from a 6x6 Forever in Time Vintage Two paper pad from the Dollar Store. The stamp is another image from the Inkadinkado Meadow stamp I used on my last card. I think it is also NBUS as I do not remember using this image before...but...one never knows. To help keep my goal of using a NBUS item on every card I post this year, I am now adding a red dot to items as I use them, and also to items that I know for certain I have used in the past. As you can assume, sometimes it gets daunting to remember. In keeping with my last card, the image is again stamped onto a snippet of Momento faux inky card. I matted it with another snippet of black card. I added some pop dotted butterflies that are also from the Dollar Store. They have a lovely glittery surface. The indigo inky background and my silhouette meadow flowers stamp now qualify for Mrs. A's Butterfly challenge. Check out her lovely challenge. 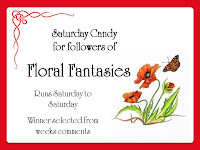 She has great themes and some lovely prizes! Over the last few years,I used to go to the Dollar Stores with my neighbour (the cardmaker). 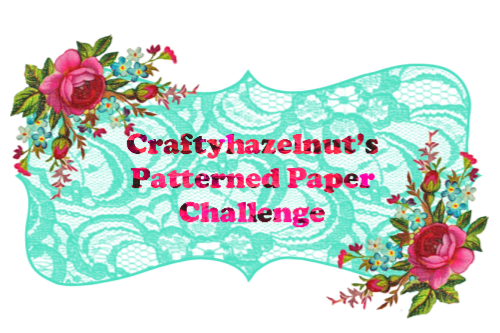 I would pick up items for scrapbooking or cardmaking and stash them away in my craft room. I am making an effort to use up these items as I would like to use them up and regain the real estate they occupy in my craft room! Keeping that in mind, I am now working on several more sympathy cards just like this one. Might as well use all 4 pages of the black script background and the rest of the blue butterflies! 1.The Butterfly Challenge - the colour indigo and a silhouette and a butterfly of course! A wonderful Sympathy card Maureen, I love the script background and the meadow flowers silhouette. Beautiful butterflies too. A beautiful sympathy card Maureen. Great card for a sympathy one and it fits the butterfly challenge nicely too. Always useful to have a supply of sympathy cards to hand, I know exactly what you mean about friends asking for them. This design is beautiful, the stamped scene is peaceful and looks lovely with the background paper and glittery butterflies. It's a lovely sympathy card, Mo. Your quest to use up NBUS is admirable and so well organized. I am trying to use up old stuff, but haven't gotten as organized about it as you have. Beautiful card! I love the soft look. Great job using up supplies, too. Beautiful sympathy card, Maureen--love the scene & the butterflies are a perfect addition! Beautiful sympathy card and good for any gender too. I love the silhouette flowers images and the script pattern too! what a very wonderful sympathy card. As Jane said a very tranquil scene and so lovely. Love the script paper used it goes so well with that lovely image and your butterflies are so pretty also. Unfortunately Maureen I have had to restock my sympathy cards too, I must admit I find it the hardest card to do, apart from male ones. This is really lovely creation, as Jane, above, says just as a sympathy card should be. A lovely serene looking card, I love the meadow stamp, and the butterflies are so pretty. This is so beautiful and the pastel colours against the indigo are perfect. Thankyou for fluttering into the garden. Hugs Mrs A. A beautiful card Maureen, perfect for a sad occasion. Beautiful sympathy card. So soft and tender. Ps. Did you get my email? Very fitting for the occasion Mo. Like you I am trying to use up stuff to gain space! What a lovely card, Maureen. Well done on using your NBUS consistently. I do try to use my NBUS on a regularly basis, but not on every card I make. And of course, there's always new NBUS creeping in, such as the lovely Christmas die that I won last month. I wanted to let you know it arrived this morning (thanks again!) and I'm hoping to use it soon, maybe for Darnell's new NBUS challenge that is about to start. I love the Inkadinkado meadow set and you've deployed it splendidly on this sympathy card. I like to make one or two when I DON'T need them so I haven't the trauma when I do. hank you so much if you take the time to comment! Sorry but anonymous comments have had to be blocked due to a spam avalanche. This is a public blog. Those leaving a comment on any post on this blog or entering a piece of artwork into a linky do so in the knowledge that their name and blog link are visible to all who visit this blog and in so doing have published their own personal details and consented to my use of that personal information should they be selected as a winner or to accredit work.